A second attempt at getting this loaded. I’m not going to tell you a lot about the machine as you can find all you need to know online. I just want to give you a heads up that the Tormek is well worth looking into. A short while ago I asked for some advice on the hand tool forum regarding some new hand planes I’d bought. Knowing how controversial sharpening is, I said that I had a hand honing method that I was satisfied with so I didn’t really want any advice on that. Well, I am now eating humble pie after buying the Tormek T7 sharpening machine. Can’t remember what motivated me to start reading up on the Tormek, but I wound up reading dozens of reviews about it and I visited their website and also the Tormek user forum I found there. The forum is not operated by Tormek. The moderator Jeff Farris demonstrated the Tormek at woodworking shows for many years, and you will see him in many Youtube videos demonstrating the older versions of the machine. I also watched all the videos I found on the Tormek site and Youtube, and I read a lot of reviews comparing the Tormek with just about every other machine system out there and the Tormek was always rated head and shoulders above their competitors, not just because it creates really sharp tools, but also for quality (10 year guarantee), flexibility (sharpens almost all edge tools except saws) and company support and service. Another advantage is that they have been continually making small but important improvements over the years with new components and holding jigs. Older machines can be updated with the new jigs and components as they are designed to be compatible.The only negative comments that popped up was the price, which is around $700 in the US and substantially more in Norway due to taxes. However, the reviewers and users always said at the end that it was worth the price because it performed as advertised. After reading all that I started wanting one (badly) although I was still a little skeptical after seeing the striations on the bevels of tools that had been sharpened and honed on the Tormek. Also, I recently spent quite a bit on some new tools and marquetry supplies and equipment so I was hesitant to spend even more on a sharpening machine. I have been getting satisfactory results with hand honing, so it was difficult to justify the extra expense. I was getting tired of sore fingers and wrists from my arthritis (it’s always good to have a medical excuse to buy a tool). So I took a leap of faith and bought one. Very little. I have only sharpened one old chisel and one old plane blade, but the results beat my hand honing and leave edges that I could shave my face with. To be honest I am amazed. 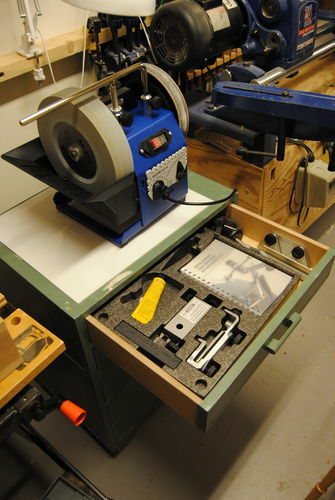 The machine comes with two jigs, one for straight edge tools like chisels, plane blades, spokeshaves, etc. and also wheel dressing jig used to keep the stone grinding surface a perfect 90degrees to the side of the stone. In addition, I bought a scissors jig, which can even sharpen hedge clippers besides, a knife jig for the household knives and a small knife jig for my chip carving knives, pocket knives etc. These haven’t been used yet. The jigs are made out of aluminum and they are very well made and heavy. I have it on top of a little chest of drawers I made for the shop and it’s placed next to my lathe, because I could’t find any other place for it. I put a small sheet of opaque plastic under the machine to make it easy to clean up any drips from the water trough. The machine has to be turned around after sharpening on the stone to use the leather honing wheel which will then revolve away from the edge instead of into the edge as for the stone. Tormek sells a small revolving base to make that a little easier, but I have wheels on the stand, so I just revolve the whole thing. So far I am using only the top drawer for the jigs and other accessories. Here’s some shots of it. And here is the result of my chisel sharpening. This was taken with a flash and please note the absence of any candle on the edge. I shave my arm, gave it the paper cutting test and tried it on pine end grain. It passed all the tests with flying colors as did my plane blade. From comments on the Tormek forum, it’s my understanding that HSS planer blades with nicks take forever to sharpen. There is a special jig for them and it works well, but the stone revolves slowly in a water trough at only 90rpm and even with the stone graded to 220 grit (can be graded with a grading stone to 220 or 1000 grit), it is not aggressive enough. 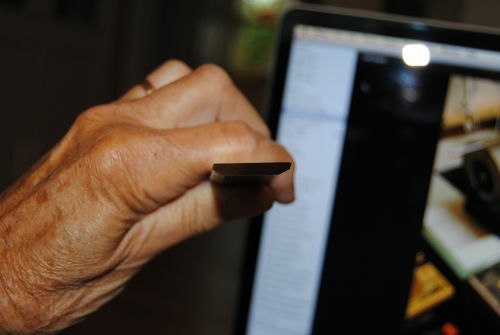 It will however sharpen fine just to restore bevels and hone edges that aren’t damaged. Carbon blades shouldn’t be any issue. The same goes for HSS turning tools. Reshaping is best done on your bench grinder and Tormek sells a relatively cheap accessory that allows you to use all your Tormek turning jigs for reshaping and heavy grinding on your bench grinder before final sharpening and honing on the Tormek. You don’t have to reset your jigs after heavy grinding, just put them onto your Tormek with the same settings and sharpen away. This is one of the best investments you will ever make in a shop tool. It’s a simple machine and easy to use, but you do have to learn to use it correctly to get good results. The machine comes with a great instruction booklet and a CD showing how to use the various jigs. The handbook also shows all the edge tools it can sharpen with reference to the appropriate jigs to use. Great and thorough review. I was sort of hoping you would say that the thing was awful so that I could quit thinking about it! 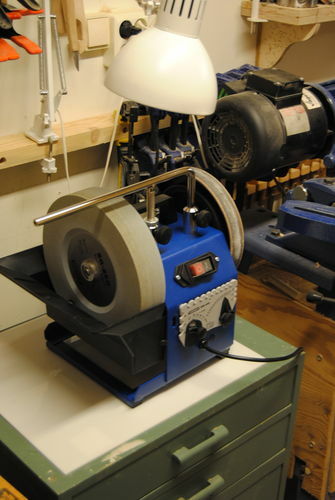 Great review stefang, the Tornek is the epitome of sharpening equipment, with jigs to cover almost any tool sharpening requirements where the finest “edge” can be repeatedly produced. The price may be a deterrent, but the Tormek is an investment that you won’t regret. Thanks Marcus and Roger, and Rob too who commented on the first version I posted and which got deleted. I can’t wait to try out some of the other jigs I bought for it as soon as my wife lets me out of the garden! Glad to see you’ve seen the light and came over to “Dark Side”. ;-). Unless you’ve tried a Tormex, it’s hard to convince a lot of people that it’s worth the price. I started out with the four grades of Arkansas stones, tried the Japanese water stones, the diamond plates and the graduated grits, but for speed, accuracy of grind and super sharpness, I always come back to and use my Tormex. Mine is green and from the mid-90s, but I’ve upgraded it with the improvements as they’ve come out, and acquired just about all the jigs (except the planer/jointer knife jig which I don’t need now since I recently converted to Byrd Shelix heads). Mine still runs great because Tormex is absolutely top notch quality! The more you use it, the more you’re going to love it. Congratulations on coming over to the Tormex side. Mike I have one and hands down when I have a lot to do or a blade to get back into shape, this is the best method. I use stones to get a fresh edge because of te hassle of getting the tormek out. When this one burns up I will get a new one. I am the 3rd woodworker to own the one I have. What does that say about the product? Thanks John and Dave for reinforcing faith in my new Tormek. I think Jeff Farris must have won over a lot of folks in the US with his demonstrations in past years. I think for those very few folks who haven’t had success with it just haven’t learned to use it properly. I am glad that I had learned enough about sharpening /honing before I bought the machine, because now I am more aware of the process and more sensitive to it also. I probably would have ruined it if I had bought one early on in my woodworking days. One other thing I like about the machine is that it is very easy to hone with a little diamond paste just to tough up a chisel or plane blade or whatever is in use, even though you might not have water in the trough to use the stone wheel. I hone with just a piece of horse hide impregnated with green honing compound I got from TFWW http://www.toolsforworkingwood.com/store/dept/TH/item/MS-GREENHN/Green_Micro-fine_Honing_Compound . All it takes are a few strokes before and after on chisels and carving tools, and tools stay sharp for quit awhile between Tormex sessions. Also, I found the Tormex great for changing the contour of carving tools—rough it out with my white grinding wheel and finish with the Tormex and jig. I’ve had mine for many years (the original green one). It’s still going strong and I love it. If it has one draw back, it is the setup time- roll it out, get the water, align the jigs, etc. I usually try to do a bunch of stuff during one session. John, above, has it right. If you need to do a major reshaping, it is faster to remove the bulk of the material with a bench grinder and then finish with the Tormek. Thanks Lew. I am aware of that. I agree about the setup time, but using the honing wheel freehand shouldn’t take much time. I have a dedicated place in the shop for my Tormek. I plan to build a lightweight box to keep it covered for when the sawdust is flying. As far as grinding, I do plan to continue using my bench grinder for shaping/repairing chipped edges, etc. I consider the Tormek a sharpening machine, not a grinder. I have a cheap model of the same, and could not live without it. In combination with my Japanese stones, this is a Tool I coud never imagine to live without. I have the T-7 as well, and agree with your comments about its effectiveness. It is a well built grinder that I should be able to pass on to my grandchildren. As others have mentioned though, the time it takes to set it up, align it etc. keeps me from using it, if I’m doing a project and need to sharpen eg. one chisel or plane blade it is quicker to use a different method. Thus, it sits under its cover in a corner of my shop gathering dust. Probably the most useful (and expensive!) tool that I don’t use. Mads Thanks. I never thought I would need or want one, but that changed fast. I’m glad to see you posting again! Rob I haven’t been in the shop much lately, but I did sharpen one chisel and one plane blade so far that I had the opportunity to use last wednesday and Thursday when it rained here. I used the chisel all day( on soft wood). At the end of the day it still seemed very sharp, I’ve never had an edge last so long. I tested it with the paper test just to see how sharp it really was. It failed the paper test so I touched it up on the stropping wheel. That took just 30 seconds and I didn’t need to put water in the trough just to use the leather wheel. I did the paper test again after stropping and it cut the paper beautifully. With the longevity and the easy and quick restoration of the edge I can’t see that it is too time consuming. I do think it’s use has to be well thought through because of the need for water and replacing the water often to get rid of the muck. The jigs also take a little time to set up and the sharpening process isn’t very speedy, at least the first time. After that it goes pretty quick. That said, I still think it’s use can be optimized with good sharpening routines. Of course I’m still new to the machine, so only time will tell. I suppose that the type of work being done in the shop and the type of tools being used might also be a factor. I appreciate your comments Rob and I am looking forward to see how it works for me in my shop.